Summary: News headlines on graywater regulation, graywater news archive, and links to other news sources. How to spell greywater (grey water, graywater, gray water)? Today California's new greywater standards took effect. The occasion was marked by a City of Santa Barbara sponsored greywater workshop attended by 120 people. A collision of world views was in full evidence at the California Building Standards Commission hearing yesterday on HCDs proposed new graywater standards. Highly qualified stakeholders spoke passionately for and against the adoption of the new standards as the hearing roller-coastered dramatically to its conclusion. The commissioners are to be congratulated for their leadership. It is always more work to set up a new system than to fit into an existing one. It would be a lot easier to stand aside as legal buildings continue waste resources and pollute the environment. However, in the face of deeply entrenched, powerful opposition, the commission is rising to the challenge of revising all of California's building codes to allow/ require better building systems...besides its emergency approval of the new graywater standards yesterday, the BSC is also revising California's Green Building Standards to include many new mandatory and voluntary measures to reduce negative impacts and increase positive impacts of California buildings. 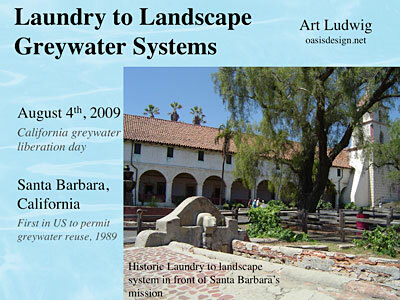 Art Ludwig will be holding a press conference August 4th, 2009 from 9:00 to 9:15 am, at the Santa Barbara Library Main Branch, at the start of his free, City of Santa Barbara-Sponsored workshop on Laundry to Landscape systems. 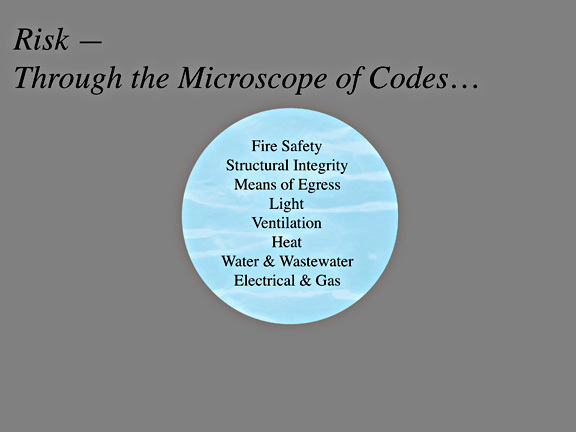 He'll tell the story of this codes process (biggest stakeholder meetings for any code promulgated by CA HCD), and discuss the significance of the Building Standards Commissions historic shift towards considering all factors; not just occupant safety, but also off site and future impacts. (BSC is currently revising California's Green Building standards, another sea change). Full text of Art Ludwig's testimony to the BSC lots of good quotes, including stuff cut to make the 3 minute limit, followed by quotes from other sources. Laundry to Landscape — Free information on how to do the state of the art laundry graywater system now legal under the new law. Laundry to Landscape (DVD)— Same system description, in expanded, video form, with August 4th 2009 release date. "It is interesting to note that much of what is required or allowed by the new Green Building Code—passive solar, materials reuse, ReWater systems, on-site absorption of runoff, rainwater harvesting, etc....was developed initially by people who broke regulations in order to do the research and development. It is always necessary to pass through a layer of confusion to get to a higher level of understanding. In the narrow view, graywater reuse for irrigation doesn't seem that compelling. In the wide view...its a totally different story. Graywater reuse is key. California's institutions are in a transition between old (narrow) and new (whole picture) ways of doing things. This is creating some confusion. In some cases, the mission statement at the top has been updated to the whole picture, while the thousands of pages of code that follow still reflect the narrow view. In the unusually extensive testimony for and against the new standards, equal levels of experience and passion were on display. Both sets of arguments sounded quite persuasive, leaving the commissioners with a challenge. Law of Reality: Reality is not what it appears to be, or what you wish it to be, but what it is. Corollary to the Law of Reality: If you do not recognize reality, it will automatically work against you. Take only several hours to prepare documents, go to the counter, and receive an inspection. This sounds so reasonable, it’s hard to think of any argument against it. And actually, there is only one: No one is going to do it. No one. Well, OK…maybe a few hundred people out of thirty million. The problem is that regulators have completely failed to support California graywater users with usable advice for the past thirty years. Only one in 10,000 of the 1.7 million systems in the state have a permit. These systems are outside the narrow field of view of regulators, so the assumption is that habits are unformed. Far from it; the habit of doing graywater without permits has become deeply ingrained over this time period. Trying to sell permits to California graywater users is like trying to sell a $100 search engine that you have to register for to people who use google. Any standard that can’t compete with “free” and “zero time for compliance” is doomed to irrelevance. The only way government agencies can complete is to offer "free", “zero time for compliance” legal systems that are better, and can be installed by professionals instead of having to do it yourself. This involves surrendering the illusion of control, in trade for actually making things better on the ground. To some people that sounds like a great deal, to others, anathema. Dr. Linda Rudolf, Chief Deputy Director for Policy and Programs, California Department of Public Health, and Dr. Rufus Howell, Deputy Director, Center for Environmental Health at the California Department of Public Health spoke in favor of the new standards. Doug Hensel, chief deputy director of the Department of Housing and Community Development defended standards as a better approach than permits for simple systems. The Building Standards Commissioners grilled Doug and others with many hard questions, deliberated, and then voted 9-0 in favor of considering the standards for emergency adoption, and 8-1 in favor of adopting the standards without amendment. The California Department of Housing and Community Development will submit its revolutionary new Graywater Standard for approval by the California Building Standards Commission at a meeting on July 30th. (Graywater is household wastewater from sinks, showers, and washer machines, which can be reused for watering plants and flushing toilets). Thanks to public alarm about current drought conditions in California, and intervention from the governor's office, the new California gray water standard could go into effect August 4th, 2009 right after the California Building Standards Commission Meeting, instead of in 2011, the original proposed date. The Department of Housing and Community Development, the authors of the new standard, believe that it will likely pass. The new rules allow a graywater system that consists of a washing machine and/or one other fixture such as a shower to be installed without a permit, if the system meets a short list of reasonable requirements. This is the approach used successfully in the states of Arizona, New Mexico, Texas, and soon Nevada, Montana, and Oregon. With this change, California is regaining its leadership role for graywater reuse. The graywater regulation revolution was started in 1989 in Santa Barbara, California. It spread from there to four other communities, then the whole state, via the Uniform Plumbing Code, in 1992. Since then, while California's graywater innovation has been at a standstill, the rest of the west has left the state in the dust. California residents have set up approximately 1.7 million illegal graywater systems as a result of overly stringent, unrealistic regulations (References). The new law would open the door to upgrading these systems by the professional installation of simple graywater systems by licensed landscapers, contractors, and plumbers, improving safety, helping the environment, and providing green jobs. The City of Santa Barbara has spearheaded the recent effort to legalize simple graywater systems, such as the Laundry to Landscape graywater system. Art Ludwig's design firm, Oasis Design, is the world leader in graywater information and designs, and the publisher of the world's best selling graywater book (rated #2 in the plumbing category on Amazon.com, behind Ludwig's other book, Water Storage). Ludwig is offering free, open source design blueprints and installation instructions for the Laundry to Landscape system, among the simplest, most economical and effective graywater systems. Ludwig will teach a free workshop sponsored by the City of Santa Barbara Water Resources Division to train professionals on the installation of this system. If you'd like more information about this topic, or to schedule an interview with Art Ludwig, please call Oasis Design at 805-967-9956 or Email us . More information about the California graywater code and recent developments can be found in the California greywater policy center. 1603A.1.1 Clothes Washer System and/or Single Fixture System. 1. If required, notification has been provided to the Enforcing Agency regarding the proposed location and installation of a graywater irrigation or disposal system. Note: A city, county, or city and county or other local government may, after a public hearing and enactment of an ordinance or resolution, further restrict or prohibit the use of graywater systems. For additional information, see Health and Safety Code Section 18941.7. 2. The design shall allow the user to direct the flow to the irrigation or disposal field or the building sewer. The direction control of the graywater shall be clearly labeled and readily accessible to the user. 3. The installation, change, alteration or repair of the system does not include a potable water connection or a pump and does not affect other building, plumbing, electrical or mechanical components including structural features, egress, fire-life safety, sanitation, potable water supply piping or accessibility. 4. The graywater shall be contained on the site where it is generated. 5. 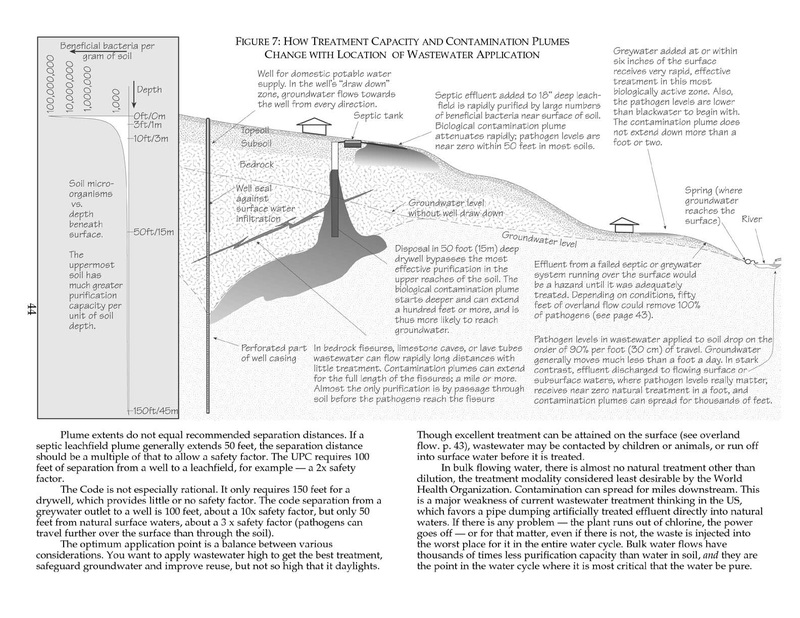 Graywater shall be directed to and contained within an irrigation or disposal field. 6. Ponding or runoff is prohibited and shall be considered a nuisance. 7. Graywater may be released above the ground surface provided at least two (2) inches (51 mm) of mulch, rock, or soil, or a solid shield covers the release point. Other methods which provide equivalent separation are also acceptable. 8. Graywater systems shall be designed to minimize contact with humans and domestic pets. 9. Water used to wash diapers or similarly soiled or infectious garments shall not be used and shall be diverted to the building sewer. 10. Graywater shall not contain hazardous chemicals derived from activities such as cleaning car parts, washing greasy or oily rags, or disposing of waste solutions from home photo labs or similar hobbyist or home occupational activities. 11. Exemption from construction permit requirements of this code shall not be deemed to grant authorization for any graywater system to be installed in a manner that violates other provisions of this code or any other laws or ordinances of the Enforcing Agency. 12. An operation and maintenance manual shall be provided. Directions shall indicate the manual is to remain with the building throughout the life of the system and indicate that upon change of ownership or occupancy, the new owner or tenant shall be notified the structure contains a graywater system. 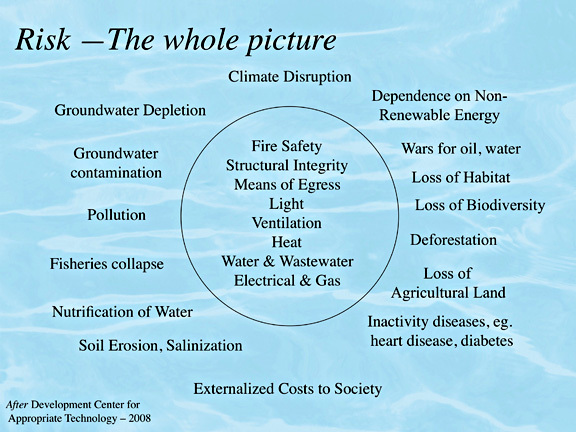 How do you spell greywater? All four ways, are correct. We use all four, so everyone can find our information on the internet: "greywater", "graywater", "grey water", "gray water." Seems that greywater practitioners and regulators can't even agree on how to spell it; most proponents use "greywater," regulators use "graywater." Since we are proponents and write regulations, we use both: greywater in our printed how to materials, and graywater in our regulatory reform efforts. If you find this information useful, please consider leaving a donation in our, Tip jar.